Mooi ingericht huis met een weelderige tuin. Elektrisch bediende rit. Gas BBQ. Geweldig audio- / videosysteem. Volledig ingerichte keuken. Gegromd marmeren bad. Buitenshuis redwood douche. Dicht bij winkels, Montecito, tennis, strand en dierentuin. Slaapkamer heeft queen bed. 2e slaapkamer heeft twee eenpersoonsbedden die kunnen worden omgezet in een koning. Draadloze DSL. U kunt lopen / fietsen naar Montecito Village en winkels / restaurants / strand. Downtown Santa Barbara is slechts 2 mijl afstand! Cliff and Gretchen are awesome and we love their home! My brother and I moved to Santa Barbara from tampa and needed a place to stay other than hotels after our cross country adventure and found Cliff and Gretchen’s home and it has been perfect! It’s in a great location so everything is only 10-15 minutes away, has a great fenced in yard, nice and quiet and as hosts Cliff was super easy to communicate with and very flexible with anything we needed! So grateful to have found this place!! The home is a very nice little cottage that is located in a nice area. Clean and well equipped. The owner is extremely nice and helpful. We've traveled every year to Santa Barbara for about 10 years and this is the first property we'd like to return to. There are two of us, but we rent two bedrooms because one bedroom properties tend to be too small for 8-9 nights for us. I was a little worried it would be dark inside from the photos, but the sun's arc in the winter means the kitchen and deck side of the house are flooded with light ( on sunny days) that extends into the living room. It was too chilly to use the deck, but it would be delightfully convenient and pleasant on warmer days. We loved the laser light outside for the holidays! The owners have supplied the full range and more of items that make living easy: we were gifted coffee beans (we don't have a grinder at home) and found, in addition to the coffee maker, a grinder. There are plenty of good (not plastic) dishes, cutlery, mugs that were large sizes (we tend to bring our rather than suffer tiny ones), glassware, pots and pans, etc. We like to cook and this is a full sized kitchen, unlike so many places that have no counter space or the footprint disappears if you open the dishwasher. New sponge, cutting boards, etc. Some places no longer have soap in the bathrooms (!) but shampoo, conditioner, soap, hairdryer, plenty of towels, and perhaps as important, plenty of hooks to hang towels (and jackets) abound. We didn't use the washer/dryer, which are located in the garage. The bed is a little on the soft side four us but we recognize that different people like different firmness of mattresses. The down quilt kept us warm, and the heat worked well although even in the winter, the house gets so much sun, there are few days and even evenings that it is needed. The house is on a very quiet corner, up a small hill with a cross street that isn't a through-street so the traffic is minimal. It's not the perfect location for people who like to be close to State Street or the beach, but if you have a car or are able to ride one of the eight (!) bikes in the garage, you can be there in 10 minutes. There are three upright, 3-speed comfort bikes, two 21-speed bikes (on the small but still adult side) and 3 kids' sized bikes, lots of helmets and a couple of locks. Next time we'll bring our own bike mirrors, since we find it safest to be able to see each other when riding without full turnaround. We truly appreciate the O'Sullivan's thoughtfulness in making this a comfortable home away from home, and hope to return. A great house and very helpful owner. Our family group of four adults enjoyed this well kept and charming home for a weekend getaway. We have often rented vacation homes and this was one of the nicest. The owners have included nice bikes, beach chairs, games and books for your use. The kitchen is well supplied.Beds are comfy. Weather was somewhat uncooperative, but we did enjoy the large deck and lovely flowers on the property. The owner, Cliff,was very prompt and helpful addressing our email questions as well....a great find in Santa Barbara! We enjoyed having coffee each morning on the sunny deck. Took the provided bikes for a scenic ride along the bike path and explored the beautiful beaches with our kids on Thanksgiving. Close drive to most areas of Santa Barbara. 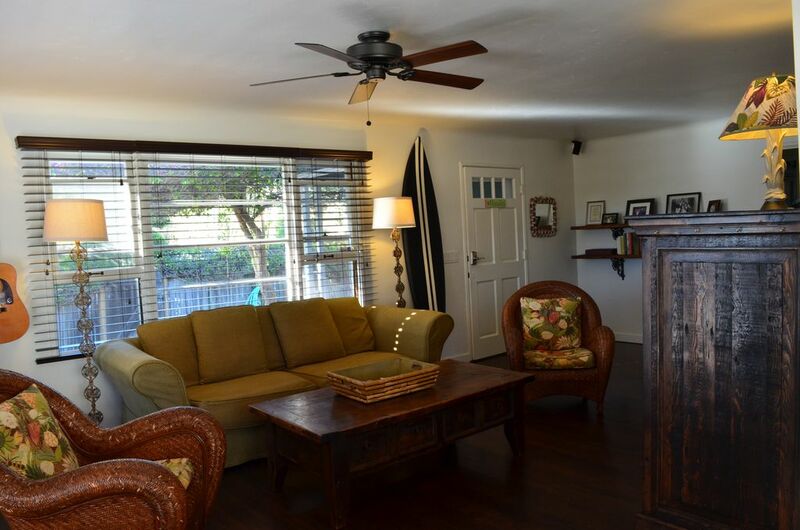 Beautifully maintained yard with a feel of Hawaii inside and out. Only negative would be some traffic noise from highway 101 in the distance that you can hear on the deck but we live in the mountains and are not used to urban living sounds. Need to drive or bike as there is not anything within walking distance. Thank you for a wonderful stay in your home. You just feel at home in this nicely decorated house. The beds are very comfortable and it has a beautiful outdoor patio where you can watch the sunset. The nice big kitchen has absolutely everything you could possibly need to cook. We rented this house for a ladies weekend, bought our own food and cooked for ourselves the whole weekend. Owner has great bikes in the garage that we rode down to the Pier about a 6 mile ride round trip. We would definitely return to this house. We relaxed and refreshed and got caught up with our lives. Two of us were from Southern CA and one from Florida. Thank you Cliff and family for sharing your house with us!